You do your 45 minutes on the elliptical five days a week or take a few group strength classes and pound the pavement in between. You’re meeting or exceeding the recommended amount of physical activity according to the CDC. Good, right? Healthy, right? Maybe not. An eye-opening new study in the Annals of Internal Medicine found that sedentary behavior (i.e. sitting at your desk or on the couch) increases your chances of getting a disease that will kill you prematurely, even if you exercise. Yes, despite your best intentions at the gym, sweating it out is not counteracting the long hours spent sedentary in a seat. In an interview with Reuters, the senior author of the study, Dr. David Alter, said, “Another way of saying it is just because one does their 30 to 60 minutes of exercise per day doesn’t ensure their health. 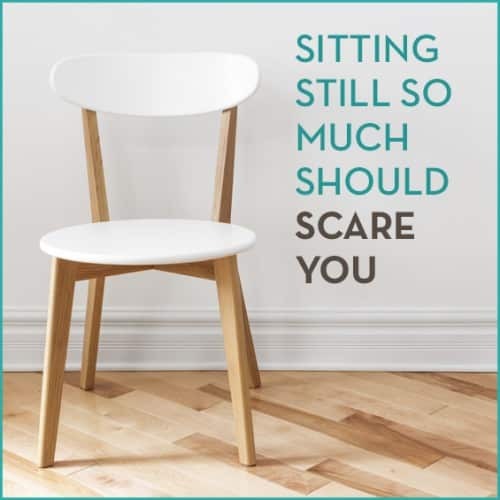 These are two distinct factors, we need both, we need exercise and need to be sitting less.” When we sit, and sit a lot, our health is the first thing that goes. The people who were most sedentary in the 47 studies this study analyzed were more likely to be diagnosed with type 2 diabetes, breast, colon, ovarian, and other cancers, and cardiovascular disease than people who spend less time sitting. Makes you want to ditch your desk chair ASAP, huh? We sit an average of 9.3 hours a day. The most ever in history! Sitting 6+ hours per day makes you up to 40 percent likelier to die within 15 years than someone who sits less than 3, even if you exercise. Between 1980 and 2000, exercise rates stayed the same, sitting time increased 8 percent, and obesity doubled. Of those who sit in front of a TV 3 hours per day, those who exercise are just as overweight as those who don’t. Prolonged sitting (sitting 8 to 12 hours or more a day) increases the risk of developing Type 2 diabetes by 90 percent. For 10-20 years of sitting 6 hours a day, you may have lost up to seven “quality life” years. This means years without medical issues or death. Want more facts that will get you on your feet? Check this infographic out! Since the majority of sitting is probably done at work, work should be the first place you look to reduce seat time. Here are four options that can help reduce the negative health effects of that desk chair. Exercise doesn’t hurt my back – it’s sitting that hurts! I personally use a Ergotron WorkFit-A station in my home office. I like that it easily moves from a standing to a sitting position when I need to get off my feet. I try to stand for several hours but often sit when working on a project that requires intense concentration. I like the option to do either. Looking to spend a little less? This Stand Steady and Muv Stand-Up Computer Workstation are both great options, as well. While a standing desk is an investment for your health, it can also be an investment for your wallet. If you’re not ready to fork over the dough, these DIY standing desks are a fraction of the cost. Break out the drill and make this standing desk using a TV console and adjustable desk legs. Take a counter, a crate, a box, whatever you have, and turn it into a standing desk. While your odds and ends desk may not be the most stylish desk in the office, your health will still thank you for standing. Our assistant editor, Hannah, turned her kitchen counter into her workstation by using a Tupperware container. You don’t have to permanently say sayonara to your desk chair but even keeping a stability ball in the corner of your office to use for half the day is better for your body! By simply sitting on the ball, your balance is challenged and you are forced to use your core muscles. Plus, with no armrests or a chair back to slouch into, you’re naturally going to keep your back straighter and taller and improve your posture. I received a new chair in the mail called the Swopper Air. It’s really more like a stool and I admit to being cynical at first about its value. But to my surprise, I‘m in love with this stool. This is a first-of-its-kind ergonomic chair that moves in all directions: backwards, forwards, sideways, and up and down. I would describe the movement as somewhere between a wobble and a bounce. Since your entire body is slightly in motion at all times on the Swopper, your muscles remain active and well supplied with blood. Studies have shown that on the Swopper you move twice as much as on conventional seats! Plus, since the chair makes you straighten the upper part of your body, which frees the diaphragm, you breath deeper and circulation is stimulated. But since I have chronic low back pain, my favorite thing about the Swopper is that it can help strengthen your back and relieve back pain. I’ve used the chair for a month so far and I not only like it – I LOVE it. By moving around all the time, albeit small movements, my back pain is not as prevalent, and I’m more alert. At first I felt a little sore in my mid-back which I think was my mid-back muscles responding to the new seat and strengthening. Now, I feel less low back pain, I sit up straight, and I’m more attentive. Yes, the price is much higher than a typical office chair, but if you have chronic back pain or need to get serious about moving more at work, the Swopper would be a wise investment for your health. You have the facts and you have the solutions. Will you get off your seat and onto your feet? If your desk chair has left you with tight hips, try our 6 Favorite Yoga Poses To Open Hips!